When I was in primary school, one of my friends had a wooden train set and I was jealous. Partly it was just about them being trains, partly the appreciation you understand more getting older of how nice wood is to work with. I’m now several decades older – I’m not going to admit how many, though let’s just say that seeing my reflection I’ve started wondering if I need to shave my ears – and truth be told, I still kind of want that wooden train set. Then I got sat down in front of Tracks: The Train Set Game at Rezzed, and suspect that I fit its target audience very, very well. Anyone who has enjoyed playing with a train set has probably had the same dream – an infinite amount of track, with the ability to ride on the train itself. And at its heart, Tracks is about fulfilling those two conditions, giving you virtual spaces to lay these tracks – and additional scenery – out in. It takes a short while to get the basics, getting the controls of adding or removing pieces, setting heights, lining up corners and fitting junctions, but once done you’re free to make pretty much any layout you want. As an added perk, it’s not only quantities of track that isn’t a limit – gravity isn’t either, letting you make skyways from place to place, or twisted tracks that are beginning to border on roller-coaster territory. Of course, when only limited by your imagination, you are limited by your imagination – as a player I’ve always been more goal oriented, and the initial sandbox on display was more useful to me as a tutorial than a blank page… though I can imagine it being a huge draw for people looking to create specific layouts. Instead, a member of the team at the display showed me a scenario mode, picking the room layout of a rather minimalist home from a choice of settings. 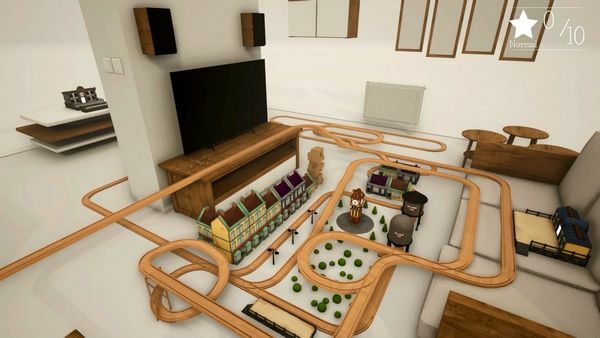 It’s a children’s toy that can appeal to adults too, with that fascination for living at toy level in what is recognisably a home, albeit one that is tidier than I believe any train set fan’s home would be. But there is something charming about it, details added that emphasise it as all being toys, such as the wood grain on the pretty much everything (viewed in detail when you’re riding in the engine) and the expressiveness of the passengers despite them only being able to hop up and down. The game’s own description mentions it as having nostalgia value, and isn’t wrong. It’s also goal – rather than victory – driven. Where so many titles on show were about defeating an enemy, which I’ll acknowledge as being as much fun for me as pretty much anybody else, this was more about being asked to make something happen. Build this route, get these passengers, go to this place… it’s a change of pace, something a little more calming, and for parents who might worry about younger children wanting to play games when the market is aiming at older players it’s also feels like a pretty safe choice. I had fun with it, more than I expected before I’d sat down to it. Ultimately it feels like a game which should offer no offence to anyone, regardless of age, and it managed to reawaken happy childhood memories of simply playing with something for the fascination of it. 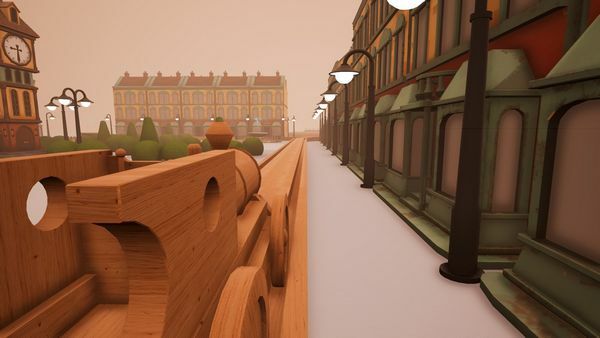 Tracks: The Train Set Game is on Early Access on Steam, and via the Humble store.